The characters played by Dennis Quaid and Zac Efron in At Any Price could almost be contemporary American agricultural family counterparts to Arthur Miller’s Willy and Biff Loman. Ramin Bahrani’s accomplished, well-acted film is an engrossingly serious-minded heartland drama, rich in moral ambiguity, that examines the challenging relationship of fathers and sons in the difficult terrain of modern commercial farming. Bahrani has developed a reputation as a sensitive storyteller, and he again shows a keen, compassionate understanding of complex character psychology, coaxing textured performances from a sturdy cast. Particularly impressive is Quaid, who goes beyond his usual easygoing masculinity to convey the craggy gravitas of a man fixated on building his legacy and heedless of the compromises that entails. Efron does equally strong work, bringing an intense, brooding stillness to the screen. The film is set in a rural community in the Southern Iowa cornfields, where traditional seed farming has been replaced by the more industrialized business of genetic modification, bringing with it increased professional competition. A quiet yearning for the simplicity of earlier times provides a melancholy undercurrent. Years after assuming control of the family farm from his judgmental father , Henry Whipple lives by the credo “Expand or die,” swooping in on funerals to snap up additional land at bargain prices. He also pushes ethical boundaries in order to compete for area leadership in seed sales. And he blithely cheats on his tender, loyal wife. Henry’s sullen son Dean has zero interest in farming. 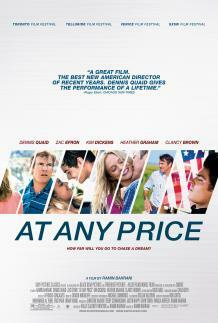 A talented stock car racer, he dreams of making it to NASCAR, but an early setback brings a cold reality check. This is a thoughtful, nuanced film that vividly evokes life in a Midwestern community in which business often trumps friendship. It offers a rueful snapshot of the changing face of a quintessential element of American life. The weight of inter-generational expectations, honor and loyalty is considered, and the limited roles available to women in rural communities are examined with intelligence.